Knowing your risk factors for a variety of diseases is a simple first step toward good health. Below is a list of quick, easy-to-use online health calculators that will give you a basic understanding of your risk for developing certain health conditions . LIVE STREAMING ON FACEBOOK LIVE from 10:10 to 11:30 A.M.
Partisan gerrymandering is the practice of drawing legislative and congressional district lines to maximize and perpetuate the power of an incumbent political party.Tom Wolf of the Brennan Center for Social Justice at NYU will speak about how partisan gerrymandering has changed the face of America. This year the Supreme Court heard a number of gerrymandering cases. The Court's decisions left open the possibility for future action and laid out several roadmaps for how to proceed. Tom will speak about next steps in the fight against partisan gerrymandering. There is no charge for this event, but registration is requested. To register, click on the button below. 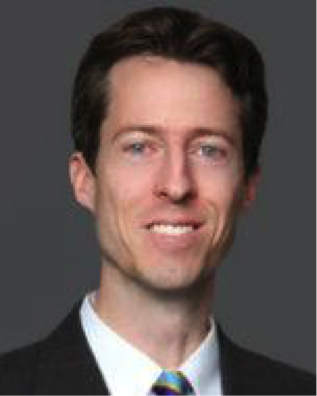 pictured above : Thomas Wolf, of the Brennan Center for Social Justice at NYU School of Law, is with Brennan’s Democracy Program and focuses on redistricting issues. He regularly participates as an amicus in partisan and racial gerrymandering cases before the United States Supreme Court and advises on litigation strategies for both state and federal courts. His articles and op-eds on gerrymandering and related topics have appeared in Time , The Los Angeles Times , The New York Daily News , SCOTUSblog , and other outlets. 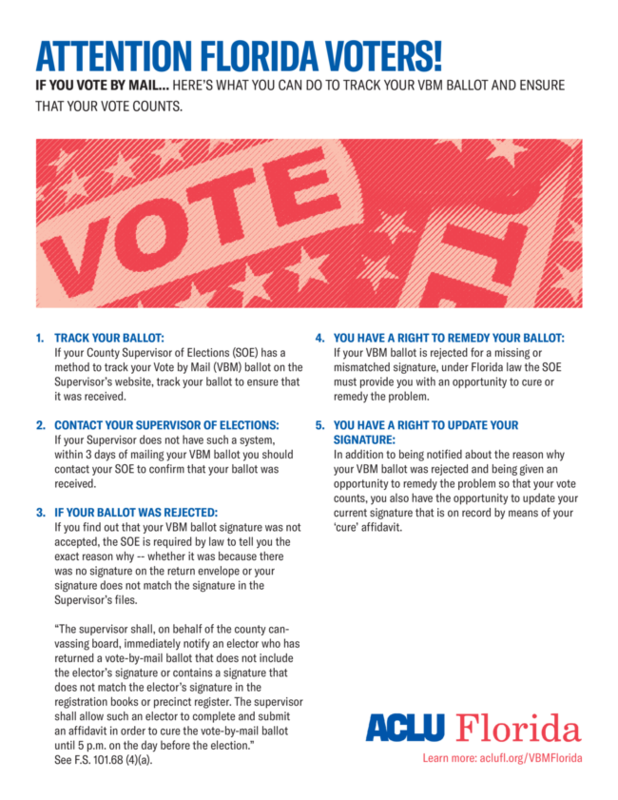 VOLUNTEERS MAY STILL TAKE "VOTE BY MAIL BALLOTS" TO SUPERVISOR OF ELECTIONS! Per Susan Bucher, SOE, "Any person who provides or offers to provide, and any person who accepts, a pecuniary or other benefit in exchange for distributing, ordering, requesting, collecting, delivering, or otherwise physically possessing more than two vote by mail ballots per election in addition to his/her own ballot or a ballot belonging to an immediate family member is in violation of state law. " This means that volunteers may deliver Vote by Mail Ballots to the SOE, so long as it is not done for their benefit. You will avoid a service fee if you log in to our website as a member. Non-members are charged a service fee when making reservations for events for which we charge fees. If you’ve forgotten your user name or password or last name, scroll down to Forgot My Username/Password and follow the prompts to login as a member. Among the proposed Constitutional changes on the November ballot, there is only one amendment that is there because of a SURGE OF GRASSROOTS SUPPORT in the state. 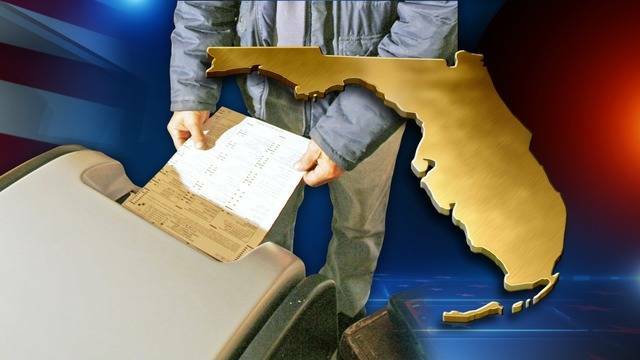 Over 800,000 Florida citizens signed petitions to place Amendment #4 - the Voting Restoration Amendment - on the ballot. Now, all of us can VOTE “YES” on 4 to fix our broken electoral system that excludes from voting 1.5 million people in Florida. Florida is one of only 3 states in the nation with a lifetime ban on voting! We do not believe in a lifetime exclusion from voting. Once you have PAID YOUR FULL DEBT TO SOCIETY you have earned the opportunity to participate in and give back to your communities. Floridians from all walks of life, including law enforcement, faith-based groups, families, and businesses support people being able to earn back their eligibility to vote. 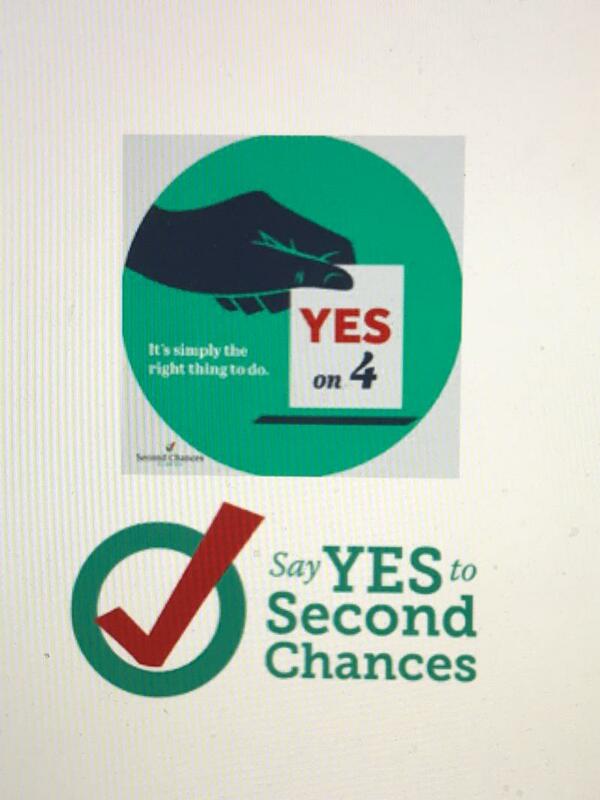 We believe in Second Chances and it is time to ensure that Florida law does as well! Amendment #1 OPPOSE Grants an additional $25,000 homestead exemption for homes worth $125,000 or more. Amendment #2 OPPOSE Makes permanent what currently is a temporary cap of 10 percent on annual property value increases for vacation homes, apartments and commercial property, effectively limiting increases on tax bills. Amendment #3 SUPPORT Requires approval of any new casino gambling through a citizen-initiative constitutional amendment, effectively barring the Legislature from making those gambling decisions by passing laws. Amendment #4 SUPPORT Would restore the eligibility to vote to persons with felony convictions who have completed their sentences. Amendment #5 OPPOSE Requires a two-thirds vote of the Legislature to approve any new or increased taxes or fees, rather than a simple majority. Revision #6 OPPOSE Vastly expands the scope of victims rights under the state Constitution; increases the mandatory retirement age for judges from 70 to 75; forces courts and judges to interpret laws and rules for themselves rather than rely on interpretations by government agencies. Revision #7 OPPOSE Creates a supermajority requirement for universities to impose new or increase existing student fees; enshrines in the Constitution guidelines for the State College System; mandates that employers or the state pay a death benefit to first responders and members of the military killed in the line of duty. Revision #9 SUPPORT Prohibits oil drilling beneath waters controlled by Florida; prohibits the use of e-cigarettes, also known as vaping, at indoor workplaces. Revision #10 OPPOSE Requires the Legislature to hold its session in early January on even-numbered years; creates an Office of Domestic Security and Counterterrorism within the Florida Department of Law Enforcement; mandates the existence of a state Department of Veterans’ Affairs; forces all counties to elect a sheriff, tax collector, property appraiser, supervisor of elections and Clerk of Circuit Court. Revision #11 NO POSITION Repeals the state’s ability to prohibit non-citizens from buying, owning and selling property; deletes a provision that forces the state to prosecute criminal suspects under the law they were originally charged under, even if the Legislature changes that law; deletes obsolete language having to do with high-speed rail in Florida. Revision #12 NO POSITION Expands ethics rules for elected officials and government employees, notably by expanding from two to six years the time that many officials would have to wait before they could lobby state government. To see the rational for the League positions, click the button below. Intern Sarah Ackerman with fellow Intern, Pam Maldonado, Marcia Halpern & Councilwoman Dr. Julia Botel of Riveria Beach. The midterm general elections are looming large. With the future at stake, voter registration and turnout is the key to how local districts, states and indeed, the country will govern going forward. WHEN WILL THE ALGAE BLOOMS END? Blue-green algae, or cyanobacteria, is a type of algae found naturally in freshwater environments. This algae is a microorganism that functions like a plant in that it feeds through photosynthesis and derives its energy from the sun. Blue-green algae can be found all over the world, and occur in Florida’s freshwater and brackish habitats, such as lakes, rivers and estuaries. Although blue-green algae are found naturally, increases in nutrients from summer storms and stormwater runoff can exacerbate the extent, duration and intensity of blooms. Other factors that contribute to blooms include warm temperatures, reduced water flow, and lack of animals that eat algae. 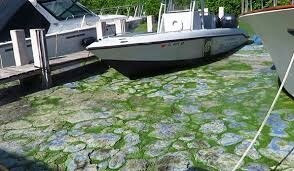 Although they can occur at any time, blue-green algae are most common in Florida during the summer and early fall, with high temperatures and abundant sunlight. If You are on Medicare, you will receive a new Medicare card between April 2018 and April 2019. CMS (Centers for Medicare and Medicaid) will mail these new Medicare cards to 60 million beneficiaries. It will automatically come to you. 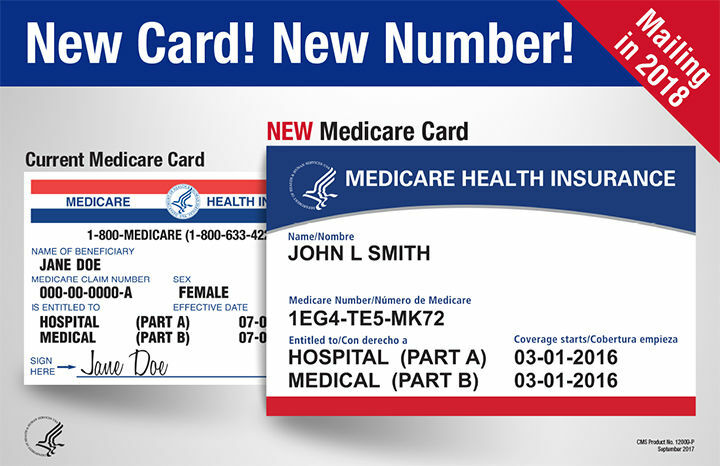 The new Medicare card will no longer display your Social Security number. Instead, it will display a unique Medicare number just for you. This number is called the Medicare Beneficiary Identifier (MBI). The obvious reasoning is to protect you from fraud and identity theft. As with the old cards, the new cards will continue to be made of paper. YOUR BENEFITS WILL NOT CHANGE. Your new card will continue to display your Part A and Part B coverage, with your start date. Celebrate Where Rivers Meet the Sea! National Estuaries Week (NEW) is a nationwide celebration of our bays and estuaries and the many benefits they provide to our communities. Each year, dozens of organizations host events in celebration of National Estuaries Week, from beach clean-ups to marsh restoration events to kayaking tours. Together, they strive to elevate public awareness about the importance of our estuaries. We encourage everyone to participate. 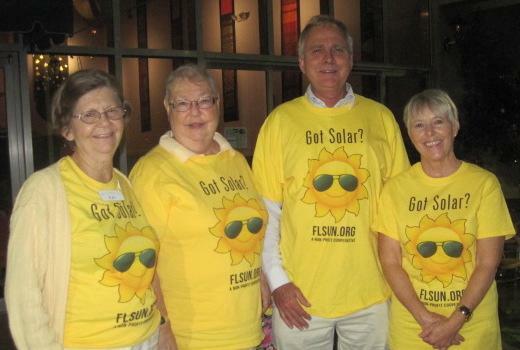 The Kick-Off for Palm Beach County's second Solar Co-op will be held on either September 27 th or 28th at the Pine Jog Environmental Education Center on the corner of Jog Rd and Summit Blvd. The Center uses solar panels to supply energy. In addition to supportive politicians and partners, we will have a speaker who has already converted to solar energy. A representative from Solar United Neighbors will be on hand to answer any questions we have about solar energy. Information meetings will be scheduled throughout the county in October and November to explain how solar power works, how the solar co-op works, and financing options. Anyone interested can join the Solar Co-op by going to solarunitedneighbors.org/palmbeach after September 10 th . A selection committee from the co-op members will select the one installer the co-op will use in mid-November. You are not obligated to buy solar panels when you join. You are asked to make an appointment for the chosen installer to talk to you. The installer will check your home, discuss your usage, and offer you several options. The Co-op closes at the end of the year. If you are thinking about converting to solar energy for your home, take advantage of the Solar Co-op in Palm Beach County. The Steering Committee for this Solar Co-op is forming now. Iif you are interested in helping, please contact Diane Marks at 752-8311 or dimarks@gate.net . The commitment will be from August through December, 2018. 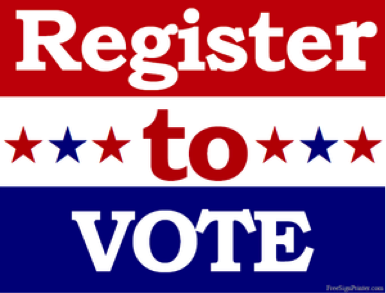 Tuesday, September 25 th , designated National Voter Registration Day , is fast approaching! 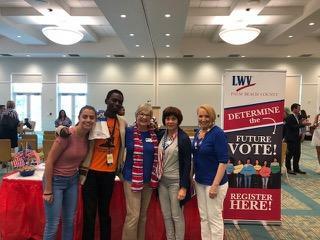 On that day our League, in conjunction with the Palm Beach School District, will be doing simultaneous voter registration in 23 high schools all over the county. It is a huge undertaking and will require a lot of people. If you want to be a part of this ambitious project, you must be trained and also sign up on the "Google Docs" sheet maintained by the School District-- not on the League’s calendar of events . Click the "Sign up" button to access the School District’s Google Docs page. If you have not been trained or have any questions, please contact Pam Maldonado at 305-873-4239 or click the "e-mail Pam" button. Look for new training dates in the near future. Come be a part of this incredibly ambitious initiative! 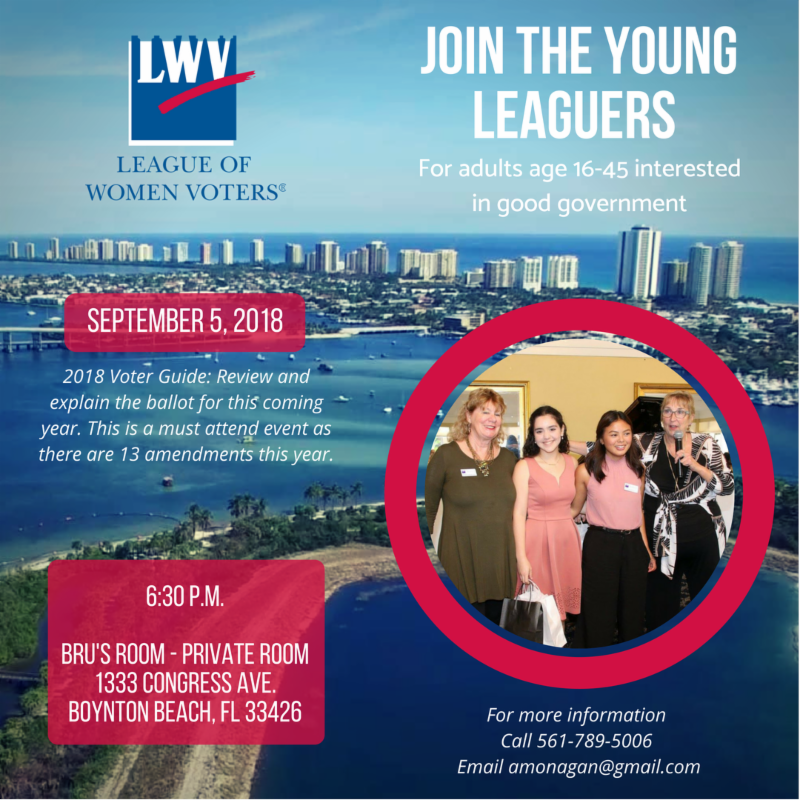 J ane Abrams , Palm Beach Gardens; Sarah Ackerman , Palm Beach Gardens; Phyllis Applebaum (SBA), Boca Raton; Linda Bates , Delray Beach; Jane Berkey , Boynton Beach; Maureen Cleary , Highland Beach; Cheryl and Robert Dodes, Boynton Beach; Joan Federman, Lake Worth; Jose Garcia , West Palm Beach; Nikkie Friedman , Boca Raton; A’Lexus Garnett , Boynton Beach; Marcia Herman , Boynton Beach; Cristian Hernandez-Perez , West Palm Beach; Elle Holzhauer , Boca Raton; Stephen Horan , Lake Worth; Linda and Doug Lamm ,Boca Raton; Gail Grace Landon , Lake Worth; Nancy Lee , Lake Worth; Mary Love , West Palm Beach; Agnes Maserjian , Juno Beach; Suzanne McGrattan , Boca Raton; Lavie Michael , Boca Raton; Sharon Plonsker , Wellington; Ginny Powell , Lake Worth; Karina Ramirez , West Palm Beach; Jo Robbins , Boynton Beach; Jean Schleifer , Jupiter; Madeleine Siegel , Boca Raton; Susan Slater-Jansen , Lake Worth; Millicent Sloan , Boynton Beach; Helena Starecki , Delray Beach; Joan Starr , Boca Raton; Alyssa Stephens , Riviera Beach; Tamara Tasini , North Palm Beach; Dale Tyroler , Boca Raton; Nicole White , Jupiter; Brian Williams , Tequesta; Judy Williams , Tequesta. Carol Nicov and Darlene Kostrub at May Orientation pictured above. 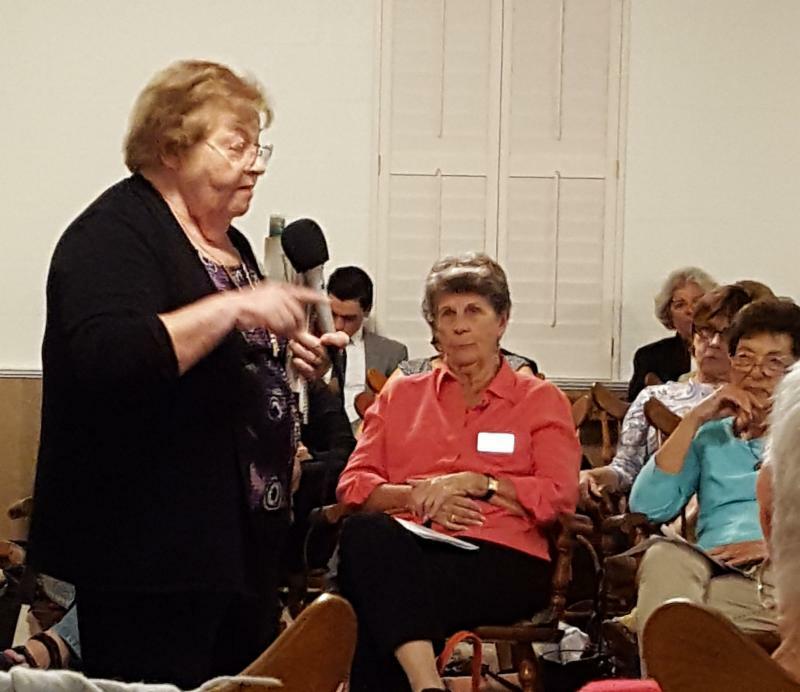 Our popular Speakers Bureau service is accepting requests for presentations. This year we want to put extra efforts to reach out to young and minority voters. If you are a present member of the Bureau or interesting in joining the group, please contact Karen Wilkerson at karenwilkerson4498@comcast.net . A training session is planned for Saturday, August 25, 2018, 10:00 a.m. to 2:00 p.m. at the STEM building in West Palm Beach (opposite the Science Museum). In addition to presenters, we need assistants and people who enjoy scheduling and know how to design power points for the group. 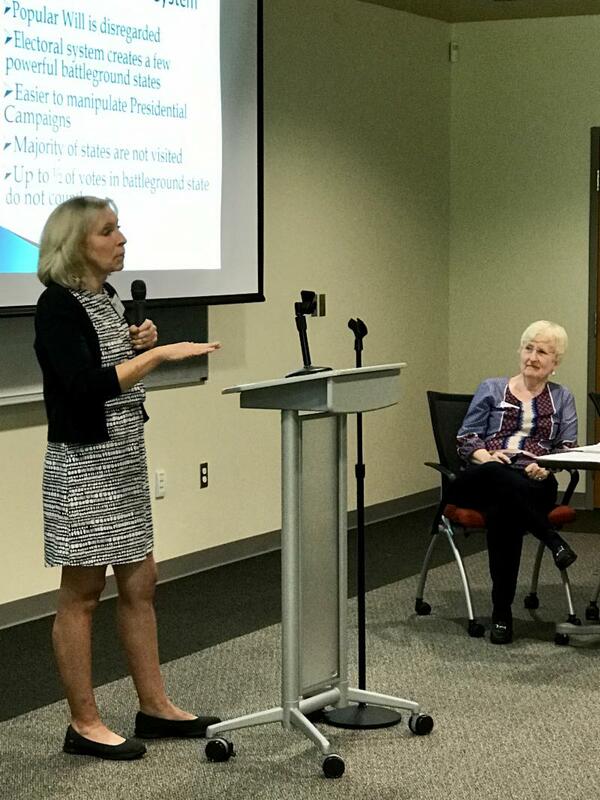 The August training will focus on the November ballot issues. Come join in this service that is valued in our communities.